The key to a successful bluff in poker is keeping a straight face. You may be holding a pair of threes but play it cool and everyone else will think you're packing a full house of kings. 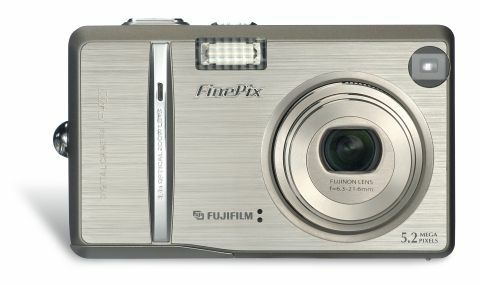 Look at Fuji's 5.2Mp F455 across a card table and you're bound to be impressed - it sports a smart brushed metal casing, and a large 2-inch LCD, yet is still small enough to hide behind a deck of playing cards. If you've got £300 to play with in today's market though, you've got a wide choice of cameras to bet on: Sony's CyberShot P200 packs a 7Mp sensor, or perhaps you'd prefer the 10x zoom lens on Konica Minolta's DiMAGE Z2? So, how does the F455 square up? It begins well, with a two second start-up time that hints at innovations within. All the controls, from shutter release to mode switches, are logically positioned within easy reach of your right thumb and index finger. One thing that might confuse initially is the apparent lack of four-way navigation pad. Then you realise that the zoom rocker, together with the flash and macro buttons, also control menu navigation. This makes for intuitive use, although the zoom rocker is small, sharp and far from comfortable over extended periods. The 3.4x Fujinon zoom lens is fairly fast and quiet, although it does make a chattering noise when auto-focusing. Shutter delay is also good - well under half a second - but don't expect the Fujifilm to keep up its speedy work. Without a continuous shooting (burst) mode, you have to wait up to three seconds after taking a shot before the camera's ready to fire again. The auto-focus system is pretty reliable though, even in low light, and lets you focus down to 9cm in macro mode for close-ups. On the back, the 2-inch LCD is what we've come to expect, with punchy colours and an average refresh rate. However, be aware that it's prone to freezing up when focusing. If you plan to use the optical viewfinder for panning or fast-moving subjects instead, forget it. It's tiny, distorted and provides less than 80 per cent coverage of the frame. Half-press the shutter and the F455 flashes up its chosen aperture and shutter speed. Perhaps this means there's some manual functionality inside? Unfortunately, it's just a bluff. The F455 only offers full auto mode plus the four standard programs (landscapes, sports, portrait and night). Select Manual mode from the colourful menu and you get some control over white balance (six presets plus auto) and exposure compensation with useful visual feedback. The other key button is Fujifilm's F menu. This gives control over size/ quality, colour effects and sensitivity. Full marks to Fujifilm for including a low ISO80. This delivers fantastic colours for daylight shots. Even more respect for an ISO400 setting that betrays little grainy colour noise. If Fujifilm can keep noise this low on a tiny 1/2.5-inch CCD, other manufacturers really have no excuses for noisy 1/1.8-inch sensors. Minus marks for the Chrome and Black and White filters though: these are best avoided altogether. That's it for creative features; there are no focus, metering or drive options, nor control over sharpness or contrast. The built-in flash is rather weak but gives well-judged, even coverage for night-time portraits. It also has useful slowsynch and red-eye reduction modes. There is a movie mode, but at only half the size (320x240 pixels) and frame rate (10 frames per second) of many rivals, clips are decidedly jerky and unimpressive. In stark contrast, still image quality is outstanding. Colours are rich, grain-free and well saturated, without appearing artificial. The lens doesn't suffer from noticeable purple fringing or distortion, and reveals good levels of detail, even in complex images. Stick to Fine Quality 5Mp images and you won't notice any digital artefacts or jaggies at all.